Alcohol/Drug detox is the first step to cleanse the body from its toxic effects. Supervised treatment is required for withdrawal to monitor potential dangers such as seizures, hallucinations and other problems. Unlike withdrawal from many other substances, alcohol withdrawal can be potentially fatal without proper medical supervision and intervention. We are a 6-bed residential adolescent treatment center helping teens break the cycle of addiction. 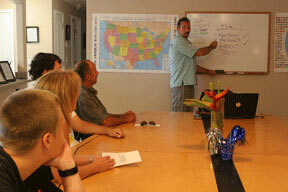 The Last Resort Recovery Center uses a variety of proven methods to reach struggling adolescents. Adolescents can follow the residential program as outlined above in residential treatment on a daily basis. Day treatment can be applied seven days a week to be determined in the individual treatment plan. The Last Resort is committed to helping you build a strong foundation for recovery that can grow along with you after formal treatment ends. Because addiction is a chronic, progressive illness, we believe ongoing support and aftercare are essential to help you avoid relapse and achieve your goals. IOP classes are held three times a week for three hours each. Aftercare meetings are designed to prevent relapse and support early recovery. It is offered at no extra charge, for treatment program graduates. Attendance is monitored and reported to referring organizations for follow up purposes. *SAFE, ON SITE TRANSPORTATION IS PROVIDED TO SCHOOL, CHURCH, ACTIVITIES, APPOINTMENTS, ETC.